2018 started off strong in the writing department. I had a project and a clear vision. I finished a story and sent it off for consideration, and by the end of Spring I finished the first round of edits on a novel. And then in Summer everything shut down. We started looking for (then buying) a house, then we prepared (and ultimately sold) our old house. So, Good News! We got a new house that we really liked and managed to pull off the buying and selling with nary a hitch. But, it occupied most of my cognitive, psychic, and emotional energy. Writing went out the window. New years allow for new beginnings. It’s time to re-title the blog and consider how to use it to enrich my life. 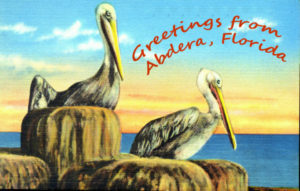 This year’s theme is Abdera, Florida. Over the last few years I’ve set several stories in the fictional town of Abdera, Florida and early on realized it would serve well as the center of a fictional universe. So this year, as I work on honing the writing craft, I will include some pieces, vignettes, stories, etc. from and about Abdera, Florida, home of the modern-day Abderites. So, Happy New Year! I hope 2019 exceeds all your positive expectations and we find some way to work together to create a better world for us all. Previous Previous post: Happy Holidays 2018!